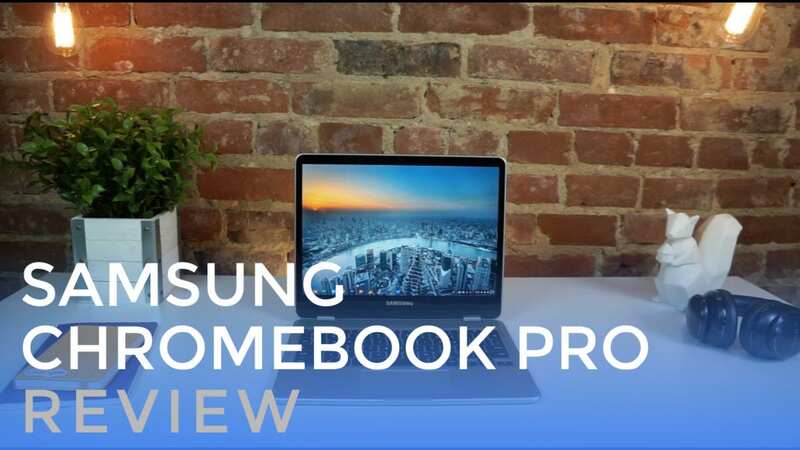 The Samsung Chromebook Pro is, perhaps, the most anticipated Chromebook release in Chromebook history. A combination of unique form factor, screen aspect ratio, and input methods, the Samsung Chromebook Pro is a device that impresses on many fronts. First, a quick note for those of you reading this review prior to April 2017. The review embargo lifted on February 10th for both the Samsung Chromebook Plus and Pro. We were given the Pro from Samsung to spend a few weeks with and review. The final Pro will actually be black, but all the hardware we are reviewing here is final. The Pro is slated for release in April, while the Plus will be available on February 12. Another note to consider: the Chromebook Pro and Plus differ only in one area – processor. All other hardware discussed in this review will be identical to the hardware in the Chromebook Plus. Though we will be doing a separate unboxing and review of the Plus once we receive it, please know that from a hardware standpoint, all the points in this review will also apply equally to the Chromebook Plus. The Samsung Chromebook Pro is a thin, light, and attractive piece of aluminum. With completely rounded edges, this device feels much thinner than it actually is. Sat next to the straight-cut ASUS Flip, you’d be forgiven for thinking Samsung’s offering was thinner. It isn’t, really. But perception and feel go a long way when it comes to devices we predominantly interact with from a touch and sight point of view. If it looks and feels lighter, it kind of is. We’ll talk about this throughout the review, but the choice to go with a 3:2 aspect ratio (read more here about all that) paints many of the design choices going on here. Mainly, because of the boxier screen, there is plenty of room for a large trackpad and spacious keyboard, despite the diminutive 12.3-inch screen size. 3:2 gives you more square inches of real estate vs. 16:9 too, so the screen simply feels more spacious. Hinges are firm, the convertible setups are sturdy and work well, and the overall aesthetic is clean and free from unsightly ports and vents. Across the bottom are just screws, feet, and speaker ports. For being so thin (0.55″) and light (2.38 lbs. ), the build feels quite sturdy, not giving much bow or flex when pressure is applied to either half of the device. My only gripe is a slight flex in the middle of the keyboard, but I had to put some real pressure on to notice it. It was never apparent in normal use. Port selection is limited, similar to the ASUS Flip, giving users access to 2 USB-C ports, headphone/mic jack, Micro SD card slot, and the already-famous pen. We’ll talk about the pen in just a minute. This port layout will likely become pretty familiar in the Chromebook market, given that USB-C is just so good at everything. The days are coming sooner than later when we’ll live in a fully USB-C world, but we aren’t there quite yet. Adapters and dongles will be in play for the short term to get things like external displays going. Luckily, USB-C docking ports from Samsung and ASUS do the job just fine and work with Chromebooks exactly as you’d expect. The downward-firing speakers are fair, but not great. Few laptop speakers are. But these do a decent job of projecting sound in any layout, almost seeming to allow some sound to radiate up through the keyboard as well. Even when covered completely, sound still came out loud and clear. Probably the shining star for the Chromebook Pro, this display is insane! 2400×1600 pixels across a 12.3″ screen makes for 235 PPI (pixels per inch) and razor sharp everything. Chrome OS has been scaling like this since the first Pixel, basically rendering everything at a 200% clip. Out of the box, your resolution is set to 1200×800, and the scaling is fantastic. With this setup, everything is a bit larger and more touch-friendly than anything I’ve used up until this point. This thing is made for touch-enabled Android apps. And I’d be remiss not to mention the crazy brightness here as well. 400 nits. That’s brighter than any Macbook (up until the very latest version) and as bright as the Pixels. No environment will give this thing any issues, regardless of the glossy screen. Viewing angles are superb, colors pop, and the bezels are nice and small, minus that bottom. I’m guessing with convertibles, this is where lots of tech hides. Almost every convertible has the large bottom bezel. I’d love for that to eventually go away. Still, I can’t say enough about how good this screen is. It makes me want to use the Samsung Chromebook Pro for just about anything I can. Not everything is perfect, though. Granted, the things I have to say about the input methods aren’t exactly a knock against the device. They are, however, deserving of a few comments and your consideration. First, the keyboard is a bit odd. Due to that 3:2, more-square screen and device shape, the keyboard is laid out a bit different. Basically, take a full-sized keyboard and shave off about half of the width off the keys on both ends and you can imagine the layout. Everything is where it should be, but those outer keys take some getting used to. The margin for error is simply smaller. After a few days with it, however, I don’t have to much issue at all. The travel is good and clicky-ness feels great. Additionally, the keys are subtly cupped to hug your fingers. There is no backlighting, much to the disappointment of many of you. There’s no indication this will change down the road, so if that is a deal-breaker, I’m afraid this device won’t cut it for you. For me, it’s a small omission, so I wasn’t concerned about it. The trackpad is fantastic. I’ve looked pretty hard at it and am under the impression that it is glass. The oil-resistance is great and the surface stays smooth for long, long periods of time. The click mechanism nails it as well, delivering the best trackpad performance I could possibly ask for. Multi-finger gestures work as expected, responding each and every time I called on them. For me, that is frequently, so that was nice to see. Finally, there’s the pen. Utilizing Wacom’s EMR tech, the Chromebook Pro and Plus both put all the magic in the screen. What this means is the pen needs no battery and is relatively inexpensive to replace. Because its smaller size, it can be stowed inside the device, giving the pen a simple, easy place to live when not in use. When put to use, the experience is still a mixed bag. Google Keep does well with responsiveness, but I had a better time taking notes in Microsoft One Note because of the lined paper option. Overall, the pen is very precise, but if it is moving quickly, the perceived lag is still a bit off-puting. Google is touting that Chrome OS is utilizing Machine Learning algorithms to actually detect where your pen is headed next to reduce lag. We’ll withhold full judgement until this device ships out and is running on the Stable Channel. Our review unit is locked to Beta Channel. Digital Pen lag is always a bit of an issue, so I don’t expect perfection. I just hope that Google’s promise of pen input updates coming in every six weeks with the main OS updates will continue to make the pen input better and better over time. As Chrome OS has clearly become faster and better with each update, I feel like we have reason to believe that. Right now, it does the job, but I’d still much prefer pen and paper. When pulling the pen out of its slot, a small icon appears in the dock near the notifications, giving users a few cool tricks with the stylus that include screen capture, screen region capture, laser pointer, magnifier, and new note. One of the really useful options is taking a screen grab and immediately being able to annotate that pic in Keep. That has already come in very handy. As time goes on, I’d expect these options to expand. Internally, we’re met with the Intel Core m3, 32GB of eMMC storage, and 4GB of RAM. Again, all this is the same for the Plus, but we simply swap the Core m3 with and ARM hexa-core chip. Something that must be considered here is the display. With all those pixels to deal with, this screen taxes the Core m3 processor. It is still plenty speedy, but I saw quite a few hiccups and lags when having multiple apps open and running at the same time. For the most part, the m3 simply kills it, but the same configuration feels faster on the ASUS Flip with its 1920×1080 screen. With substantially fewer pixels, the processor has less to handle. I’ll be very interested to get the Plus in the office to put it through the paces due to this same hurdle. I can’t wait to see how the ARM chip handles all these glorious pixels. With the beauty of this screen, though, I think it is a worthy trade off. Battery life has been good as well, delivering 8-9 hours of use on a charge. Sure, if you crank the screen up to 100%, the battery takes a hit. The great thing about this screen, though, is the fact that you really only need about 50-60% brightness to feel very satisfied while using it. Charging via USB-C happens very quickly as well, topping up the battery swiftly when you need a hit. As an added bonus, you can charge other devices quickly as well if they utilize the USB-C connector. It is crazy useful! The new Samsung Chromebooks are built from the ground up with Android Apps in mind. We just saw Chrome OS 56 launch this week along with Play Store access on the stable channel for some devices. Which other devices will get the Play Store in the Stable Channel at this point is unclear, but Samsung has made it very clear that Android App support is at the heart of this device, and apps on Stable Channel are basically guaranteed at launch. With that in mind, I’ll say that the Android experience is a bit better on this device than on others, mainly due to the fantastic screen, 3:2 layout, and the device’s deft weight. There’s still work to be done, for sure, and until we see Android Nougat and it’s resizeble apps, I think the whole app experience is still a Beta one. It works, but there are nagging issues here and there that still make Android Apps feel not-quite-finished. Running Android Apps will get much better over the next few months as we are now moving into the refinement period of Play Store support, and I think Samsung has a clear vision of this device being the absolute best at this very thing. With the screen, weight, size, and pen, I think that could very well be the case a few months from now. The Samsung Chromebook Pro isn’t perfect, but it is a step in the right direction. The combo of firm, thin, aluminum body with a mesmerizing screen simply hasn’t been done this well in a Chromebook up until now. I love the ASUS Flip C302 and Pixel, but this hardware simply has something that makes me WANT to use it. Sure, I’d like a backlit keyboard without small edge keys and, sure, I’d love to see a smaller bezel on the bottom, but the truth is I really enjoy using the Samsung Chromebook Pro. I may not use the pen that often, but when I need it, I love that it is there for use. I may not flip into tablet mode that often, but I love using it when the need arises. Again, it isn’t without it’s flaws. But the magic of this device is this: the parts it gets right, it gets REALLY right. So right, in fact, that I forget about the little issues I have with it and instead turn to it every time I want to work on the go. It makes a great productivity device while also making a fantastic 3rd device around the house. So many uses in a single device, and it simply begs to be used. After my time with it, I simply don’t want to use anything else. And, for every right and wrong in play, here, Samsung simply got that right.